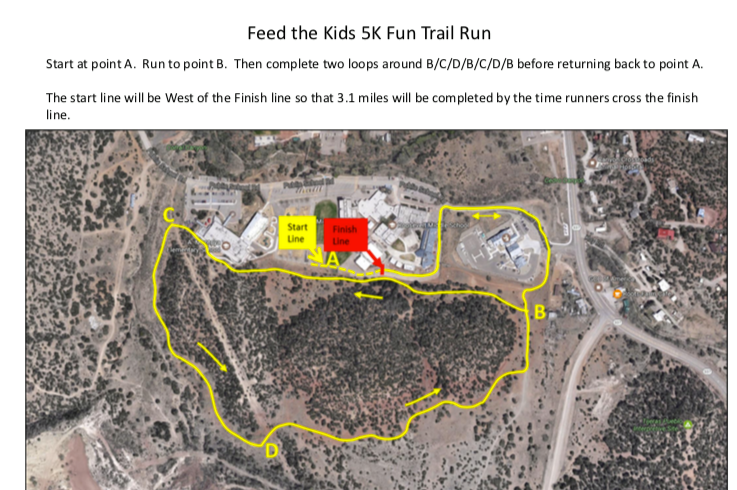 Welcome to our 3rd Annual Feed the Kids 5K/1M Fun Event. The run/walk begin at Roosevelt Mid School, 9AM for the run, shortly after the walkers will begin. 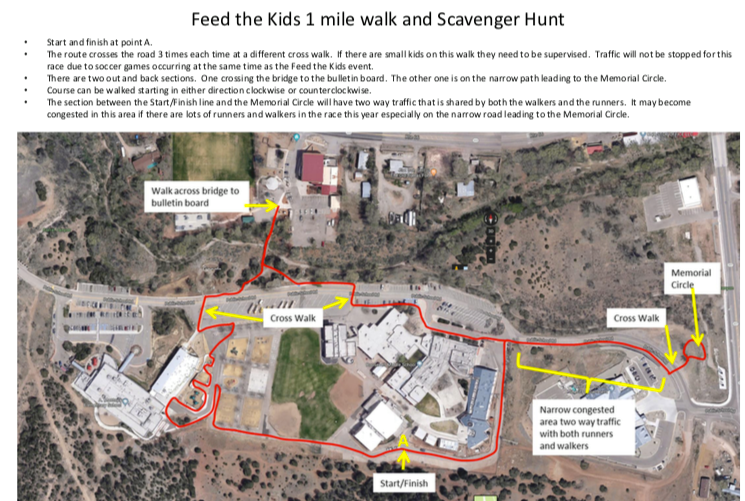 The run is mostly on a dirt trail taking runners up into wooded areas behind the school, where they will encounter elevation changes and some wonderful mountain views. Point B, C, D will be done twice, before returning to A and the finish line. This year, the 1M Walk will add some 'obstacles' along the way. Walkers will need to complete challenges to the best of their ability before moving forward and completing the course. Runners should be prepared for some mud, uneven terrain and cool temperatures. We never know what the weather conditions will be like. We will have snacks and water, on site Medical help and of course, 1st and 2nd place medals and some swag. Walkers will have prizes as well. The PAC group is sponsoring an antique car show in the parking area to the west of Roosevelt Mid School. They will have food, music and family fun. More details as I get them-check our FTKs FB page, too, and of course we will have a Silent Auction for you to enjoy. FTKs volunteers have been packing on an average, 60 bags every 2 weeks during the school year. it costs $4-5 to fill each bag. We need your help to keep providing these bags for hungry kids. Please encourage friends to come out and support the kids. Thank you!! Parking is on the North side of Roosevelt Mid School. There will be directional arrows to get you to the registration and race area. Registration will open at 8:30AM. Registration opens at 8:30AM. The Run will begin at 9AM and the Walk shortly thereafter.